| of the tour in Europe! today, we'd like to personally contribute a few thoughts to the exciting events that were shared recently. 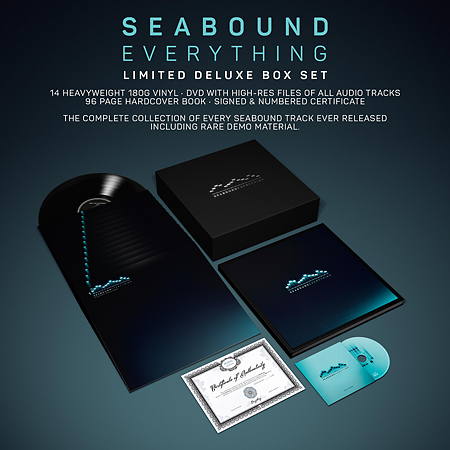 "Everything", our ultimate box-set release due out on 2 Dec 2016, can be pre-ordered here through our label. The box set with 14(!) 180g vinyl records and a dual-layer DVD-R with the full digital content is limited to 500 copies worldwide, so please don't hesitate for too long to avoid disappointment, and tell your friends. If you are not in Germany or Europe, don't worry about shipping: It's free via the above link, despite the heavy weight (yes, this includes shipping to the US, to Brazil, to Mexico, or wherever you are!). Looking back at how this box set started, it almost feels like a phantasy come true. Our label had contacted us, asking whether we'd like to release vinyl versions of our albums. We talked about this, and gradually the endeavor turned into a "why don't we release everything as a huge box set" dream. The label people weren't scared enough, and we had embraced the once-in-a-lifetime opportunity to a degree that it suddenly became a real possibility. Believe it or not: We worked for more than a year and a half on this release. Nico (of Acretongue), our entrusted creative friend, created a very unique artwork and a 96-page hardcover book for this release which is mind-blowing. Together with Claudia Schöne, we went through almost 20.000 photographs from the last 15 years to make the right choices for our picture pages. In addition to these, you will find all Seabound lyrics in the book, along with a guide to all 131 tracks on this release, a list of all concerts we ever played, and a retrospect on all albums, starting with our infamous demo "Die Blaue" back in 1996. We are now eagerly awaiting the final box sets. It won't arrive before mid-November though, so as soon as the sets are finished, signed and numbered, they will be on their way to everyone who ordered a copy. We hope that you will like our "Everything" as much as we do. Seabound are getting ready for the promised second leg of their Speak In Storms US-Tour. The tour will happen in the second half of February, and tour dates and venues will be announced in the next few days. Snowbound in my hometown as I'm writing this, I realize that I share this fate with many friends on the US East Coast at the moment. Here's to warmer days in the near future! And more confirmed shows in your area. Check out the latest news » HERE. The start of Seabound's 2015 North American tour together with Architect is getting closer rapidly now. Over these last weeks of crazy preparations and planning, it became more and more obvious that we will not be able to cover East and West Coast territory in one go this time. Part of the situation is due to rather tight time ties caused by our daytime-jobs. Another part, however, has to do with our decision to visit not only the big cities this time, but also bring "Speak In Storms" to places we have never played before and that may not be considered "primary" by the book-keepers. Still, these places have dedicated fans and followers who we would like to meet and play for, at last. This is why we have made the (hard) decision to split our touring activities into two legs: We will play East Coast and Midwest locations this year. The furthest we are going to go west will be Minneapolis/St.Paul (MN), so we won't even make it to our dear friends in Colorado or Texas. Early next year, we will return for the West Coast. We understand that this is going to be disappointing news for our fans and friends from the north- and southwestern states and we are truly sorry that we can't simply extend the tour to see you this year. We promise to make it up to you though. The first gigs of Seabound's upcoming tour are confirmed. Stay tuned for more. "Speak In Storms" was one of the electro-industrial highlights of 2014. Now Seabound have decided to tour their successful album release in North America in March/April of this year. 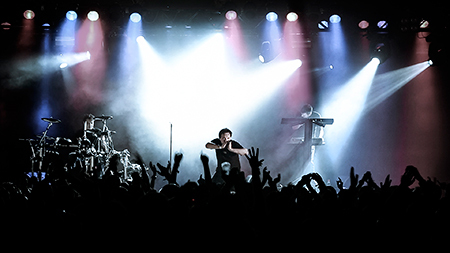 It will be their first U.S. shows since 2009, when they toured with De/Vision. "The Speak In Storms Tour in Europe was our most elaborate tour yet", states the band, "and we got some amazing fan support. We look forward to performing the new songs for the North American audience." The band is kicking off the first leg of their North American tour at the East Coast and the Midwest, while a second leg will cover remaining territories at a later time. Additionally the band is bringing along a very special guest: renowned ARCHITECT, the percussive IDM side project of Daniel Myer of Haujobb. Speak In Storms Tour: Last chance to see the show in Europe! Eight out of ten scheduled shows played, two more shows to go. This is the last chance to see Seabound live in Europe this spring. In Nurnberg (25th April) and Saarbrucken (26th April) Seabound will team up with ARCHITECT. Don't miss out! Three days from now Seabound disembark on their "Speak In Storms" tour together with Iris. We are looking forward to seeing and meeting you! At the shows, you will also have the opportunity to be the first to get hold of a copy of the limited "RADIANT TURBULENCE" EP which will include long sought-after, 18-year-old and unreleased Seabound material, fully remastered with re-recorded vocals. Good news for the owners of the "Speak In Storms" Tempest Edition. A second exclusive track is now available for download HERE. To access the site you will need the code included in the artwork. This is the day! Speak In Storms is finally released in Europe today, three days after its launch in North America. We are overwhelmed by the positive feedback received thus far. Many, many thanks for that! Keep the thoughts coming. For the buyers of the Tempest Edition, HERE is a link to the first installment of exclusive bonus content. Check the artwork for the code required to access the site, and make sure you come back again. We will add more material over the following weeks. 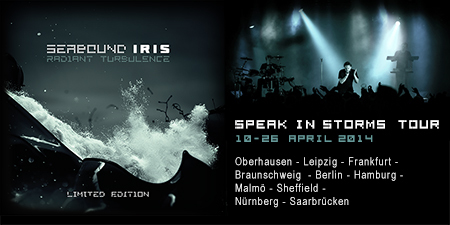 We are very pleased to announce the "Speak In Storms Tour", for April 2014, where we will be playing with our dear friends IRIS. This will be a rare, not-to-be-missed event, as Seabound and Iris have not toured Europe together previously. Dates and links are posted below. As you might have heard already, "Speak In Storms" will be available in three formats: a regular album version, a limited 2CD digipak version, and a third edition. The limited digipak version includes the album and a bonus cd with the exclusive track "When She's Hungry" as well as remixes from select music friends. The "Tempest Edition" includes the same music but doesn't come as a digipak but as a 48-page, 7" size hardcover book instead. The full tracklist and remixer names can be found HERE. Nico J. designed the artwork once again. Apart from his beautiful cover artwork the 48-page book contains the lyrics as well as additional texts written by Frank regarding some background details of the album. And there is a little "easter egg" to discover. 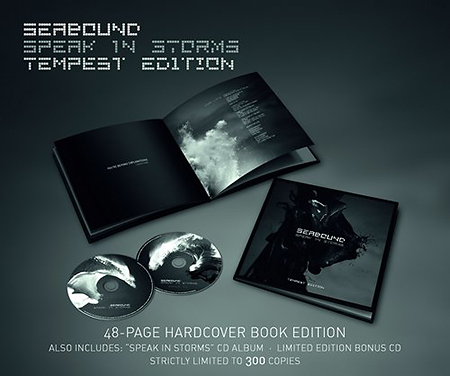 The "Tempest Edition" will be limited to 300 copies. You can find pre order links on the RELEASES page. The "Tempest Edition" will be released on February 14, 2014 along with the other editions. Stay tuned, we will release more news and snippets soon. And check out our FACEBOOK page. 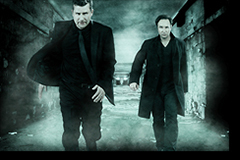 Metropolis Records has announced the release date for SPEAK IN STORMS as February 11, 2014. Our European label Dependent will release the album a few days later. Thanks to Nico of ACRETONGUE for his great cover artwork for the album. You can have a look at the artwork HERE. Meanwhile, we have received the mastered versions of the songs from the mastering studio. They did a great job, we are very happy with the results. Below is the tracklist of the regular version of "Speak In Storms"
First of all, we would like to thank you. Though it has been pretty quiet for a long time, you continued to keep us motivated with your ongoing requests for the new album. Thank you for your support, it is good to know that you did not forget about us. We have been pretty busy with the new album. We just completed the mixdowns for the latest song, and believe it or not: the album is done. The new album "Speak In Storms" is finalized. The album consists of ten songs, and we are very happy with the results. What can we tell you about the new album? If we would have to characterize it in a single sentence we would probably say "It has become a Seabound album." And: The album does not contain a single song that we were not completely satisfied with, making it difficult for us to name any favorites. The songs are pretty diverse, and the music ranges from atmospheric and cool to powerful and warm. If you attended a Seabound show last year, you have already listened to some new songs from the album. "Contraband", "Nothing But Love" as well as the opener "For Life" will be featured on the album. We were surprised how well the songs work together in the context of the album and how coherent the album has turned out to be. The lyrics delineate a relentless and intrepid journey into a psychological abyss. The own past turns into a threatening labyrinth, and dealing with it becomes a dangerous undertaking. Nightmarish scenarios, revenants and lost souls, fateful encounters, and the quest for identity. Each song is multifaceted giving different answers, some hopeful, some resigned, others lurking, and ruthless. The characters of "Speak In Storms" are out for a quest, on the run, they are hunting night and day. "Speak In Storms" is a declaration of war against compromise and mediocrity. High stakes are on the line, storms will be sparked. Time is running out. Nico J. (ACRETONGUE) created the artwork of the album. The final track list for the bonus CD is still in progress. The track list for the regular album is HERE. The album will be released by DEPENDENT Records in Europe and METROPOLIS Records in North America, most likely in February. There is a good reason for pushing back the release date until next year, which we do not want to keep from you: We were asked to either finalize and release the album this year or to release it with a bonus CD as a limited edition, with material from other artists. The limited edition would require a release date next year. Obviously, we could not resist and opted for the limited edition which also gave us more time to work on details. So in a nutshell: There will be a two disc limited edition of "Speak In Storms", and we will wait with you until February. Stay tuned, we will post further news soon.